Today is a good day. A very good day. I got my test results back from the hospital and they're benign! So very happy and relieved. A huge heart felt thank you to all of you that have shown your support over this past month. You rock! Now feeling super motivated to make September awesome. I have lots of exciting new projects I'm going to be working on over the next few months and can't wait to jump into them. I'll also be doing a month long video challenge which I'll tell you more about when it ticks off on 1st September. Despite taking a lot of time off this month to recover from my operation, plus having the kids off school, I've still managed to hit my goals for August. You can find out all the details about what strategies I've been using to grow my brand in my newsletter that comes out on the 1st of every month. There I share all my behind the scenes info and stats to help give you some ideas of the sorts of things you can do too. After collecting my results this morning I went to visit the cemetery at Piramide here in Rome which is the resting place of lots of famous writers, and artists. 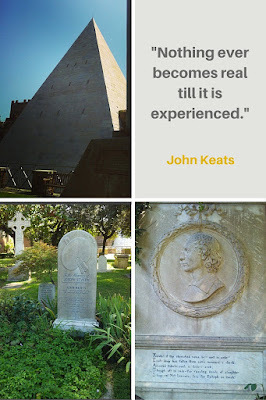 Some of the more noted ones including John Keats and Percy Bysshe Shelley. The whole place was very beautiful. Reading some of the tombstones was really inspiring. I'll be doing some sketches of some of the sculptures of angels over the next few weeks.